General Hospital spoilers say that Mac Scorpio grows upset likely over Felicia Scorpio helping to lure Ryan Chamberlain into a trap on GH. General Hospital spoilers promise Mac Scorpio and Felicia Scorpio are furious that Kevin kept Ryan hidden all these years. Watch GH on ABC to see the price Doc pays for his lies. General Hospital’ Spoilers: Mac and Felicia Bring Down Psychopath Ryan Chamberlain? General Hospital spoilers reveal Mac and Felicia Scorpio have a theory, which could mean that they could help bring about Ryan’s downfall. ‘General Hospital’ Spoilers: Ryan Chamberlain To Wipe Carly’s Memory and Terrorize Felicia? 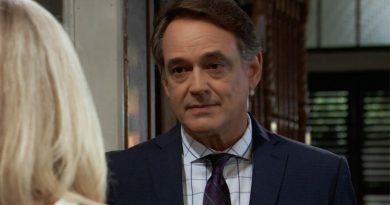 General Hospital spoilers expect that Ryan Chamberlain (Jon Lindstrom) may become Carly Corinthos’ and Felicia Scorpio’s worst nightmare.